Stephen Stills called her Judy Blue Eyes. The color is still vivid but the first thing you notice is the fierce intelligence that informs those eyes. There’s a wariness too, common to those who have spent long years in the public eye. But that dissipates at the first mention of her father, Charles Collins, a legendary radio host in Denver where Judy spent much of her formative years. Chuck Collins was a larger than life figure – he never let the fact that he was blind hold him back from anything, including, apparently, driving a car. However, it was his identification with his Irish roots and his love of music that was to give Ms. Collins a foundation that would stand behind her through a vaunted career. As likely to burst into song around the house as in the radio studio, he gave her Danny Boy, The Kerry Dances and countless other ballads – all of them links to a homeland that he never visited though its soul was ever restless within him. He provided her with the DNA of the song that would introduce me to her back in McCullough Pigott’s music store in Dublin. In those days you could take a private listen in a booth before buying an album. The voice that emerged from those muffled speakers was clear and cool as a mountain stream flush with melted snow. Her delivery may have been calm and controlled but there was no doubting the deep well of feeling from which it sprang. Amazingly it was only the fourth song she ever wrote. Pain, regret, hope, optimism, and many of the other high and low water marks of the human condition surfaced in a magical five minutes. Her father never heard it. She finished it four days before his death. She didn’t make a big deal of this; in a life of tumult and creativity such things happen. Mark them and move on, for as much as she’s experienced, there’s always a new song to write, a new performance to be given. That’s why the Irish American Writers & Artists will bestow the fourth annual Eugene O’Neill Lifetime Achievement Award on Judy Collins tonight. It will be given as much in recognition of the promise that lies ahead as for the trailblazing life of achievement she’s led. 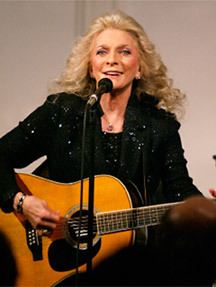 As befits the honoree of an organization set up to pursue progressive goals shortly before the 2008 Presidential election, Judy Collins has long stood for civil rights and an ongoing insistence that every woman, man and child on this planet deserves to be treated with human dignity.Perhaps her finest quality is her generosity to other artists – despite being a master songwriter she has never stopped championing the talents of Bob Dylan, Joni Mitchell, Jacques Brel, Randy Newman and perhaps, most famously, Leonard Cohen. Had she not persuaded a reluctant Mr. Cohen to perform for the first time at Town Hall in 1967, and then insisted that he return after he fled the spotlight with an extreme bout of stage fright, we would all have been the poorer. But that’s Judy Collins for you. The tales of her intuitive kindness are legendary. No doubt her friend, Tom Paxton, will expound on this and others of her sterling qualities. Or he could just play us her version of his classic, “The Last Thing On My Mind”. Dry-eyed and cool as a prairie winter she breathes new life into this tale of regret and sends the turbulent years reeling away. At such moments you can trace the graceful woman back to the girl in the Colorado kitchen listening to her father sing the songs of a country he never set foot in but knew so well. The Irish American Writers and Artists are honored to grant the Fourth Annual Eugene O’Neill Lifetime Achievement Award to our sister, Judy Collins.